Keypass — $55, and supposedly recognised nationwide. Proof Of Age card — $10, and also apparently recognised throughout Australia. It seems other states have similar cards to the Proof Of Age card: NSW has the NSW Photo Card. Queensland has the Adult Proof of Age Card, and so on. One commenter yesterday mentioned the International Student Identity Card — but according to the posters summarising the law, this isn’t necessarily recognised. Apart from a liquor-licensing point of view, some retailers also want to see ID for certain card transactions, apparently due to their own paranoia. While my son Isaac is reluctant to learn to drive, I think it’s still an important skill to have even if you don’t want to use it… and as others noted, there are insurance premium implications later down the track. But for now I think we’ll go for the $10 Proof Of Age option. ← Previous Previous post: Stay on the train, or join the traffic? Some young adults are rejecting cars. Next → Next post: Is there enough promotion of the good stuff in PT? It’s definitely a useful skill even if you don’t own a car or drive regularly. What happens he’s out with mates and ends up being the only one sober enough to drive home? Or if in the future he goes on holiday and wants to hire a car for a few days? Mind you, I gather that actually getting a licence in Australia is so difficult/time consuming these days that I can’t say I really blame him for not being keen. Tiny note of caution – Proof of Age card, and other such, even though issued by the police (I think? ), count for nothing once you’re outside of Australia. I have had friends turned down from entering clubs and bars in Europe, while I could easily get in on an Australian Learner’s Permit. Jana, if you leave Australia, you would be well advised to have a passport. Daniel, what’s the difference between “nationwide” and “throughout Australia”? Is that something to do with our “migration zone”? I obtained one of those, ten years ago. They are useless in many examples, because ‘they are issued by a private company’. Federal legislation in many cases, ‘requires photo id, of which has been issued by a government agency’, and that is why I went for the proof of age card as it is done via VicRoads, a State government department. Also, the 100+ ID count, can only count ‘government issued ID’. So, the keypass can not be accepted there. You can’t go wrong with the most popular card, the most forged card, and that is Keypass. Higher insurance premiums later compared to the money he will save now by not having a car is nothing is nothing. He will be miles ahead. I was at the police station the day after I turned 18 to get my driving license but it was a very different time. I also know people who have driving licences who are too old to drive and don’t, and some who do but should not, and younger people who got their license but have never driven since. You can go wrong with Keypass! I had one these for a long while and attempted to use it in Fremantle when I visited my cousins. Not once did a bouncer recognise the card and let me through straight away, in many instances I got rejected from the bars I was visiting, in a few I talked my way in. Perhaps its changed since then, but certainly 8 years ago it wasn’t recognised in W.A. I have a lot of friends who have never driven even in Melbourne. If you are mainly in the inner suburbs you don’t need a car as much. I am not sure why I still have my licence as I haven’t driven a car in years. It would cost me a lot more to maintain a car and the rego than I could justify. I usually just get the train down to see my parents and do manage to get a to a music festival once a year all the way down in Queenscliff via public transport. When I turned 18 in 1977 I didn’t have a learners permit or drivers licence. I walked into a suburban police station in Melbourne and got issued with a gun licence on the spot. I then used it as proof-of-age for a few months until I got my drivers licence. Of course I never owned or used a gun! I bet Issac couldn’t get a gun licence so easily today. I never bothered getting a licence (am now over 60), choosing to live in the inner suburbs. Proving identity is the biggest drawback of not having a licence; I usually carry my passport around with me. What is the secret of so much hair when you are in your sixties? I’m in Qld and have run into several problems with not having a drivers licence or passport, particularly with financial institutions where 100 points is not easy to reach without those two biggies. Neither my wife or I drive, so we got 18+ cards many years ago as proof of age. I recently rang the Qld Police in regards to buying some scientific equipment which could be used for drug manufacture where all the paperwork said a drivers licence was required. I explained that all I had was a 18+ card and work ID. The cop said that the 18+ card was more than sufficient ID. went and got a proof of age card,(what a joke that was) being 40yr old male ,to prove i was over 18.. what a stud,;hahaha!! why is that so , and if no drivers licence and all i got are keypass and proof of age cards, WTF do i do??? 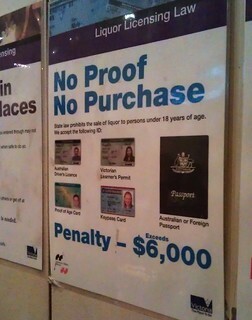 to fly to perth..
@Darren, the Vic page clearly says the Proof Of Age card is recognised throughout Australia. …however perhaps you could verify this by contacting the WA Department of Racing, Gaming, and Liquor. Daniel, am wanting to fly to perth in sept. age 53, no driver licence being on a D.S.pension, been an epileptic since i was 15yr.old from this age i knew i could never get a DIVERS LICENCE , This does not worry me ..my passport has expired 15 years ago…just want to buy aticket at airport to fly to perth, now to old to go to night clubs anyway , just want to see the sites in W.A. So proof of age card (53yr old) and a valid keypass, is o.k. to buy a ticket at melb airport -and perth will allow me ,?????? so i got valid i.D cards to fly domestic , perth , hope there won’t be a prob..Darren..
@Darren, if the specific need is flying domestic, I would contact the airline(s) involved and double-check before you fly! Keypass is now owned by Australia Post. During it time as a privately owned business it was excepted in Victoria, Tasmania and Queensland. Getting Govt approval from the other states and Territories was difficult as they were hesitant to give approval to a privately owned ID card. However the Keypass record on issuing correct and legitimate information was always without question, their ID checking processes were the most stringent in the country. An audit was done on govt issued IDs such as Licenses and Passports, as well as Keypass cards, and the results were clear…. Keypass had no falsely issued IDs. the others not so. The Keypass card was also the first to go full plastic with hologram, in front of VicRoad licenses. OK so I’m indecisive about what Card to get, but i want to know whether the KeyPass card will be recognized in NSW meaning I want to be able to use it to go out in Sydney ??? Please need help tried researching but no answers. Key passes are unfortunately not recognized in Sydney. I tried as I don’t drive and that was/ is my only form of ID- and now I’m considering getting a proof of age card or something that is recognized over in Sydney, QLD, Adelaide etc… So take your passport – I had to get it sent over as the keypass isn’t recognized in the sunshine stage. & Collins st …….forms must be lodged before 12pm & ready for pick up after 4.30pm on the same day!